Do you avoid getting up close and personal with your pet’s breath? That bad breath is certainly unpleasant enough, but your pet could have a worse problem. Tartar buildup on teeth and inﬂamed gums can actually undermine your pet’s good health. Do animals have dental disease? Sure they do! 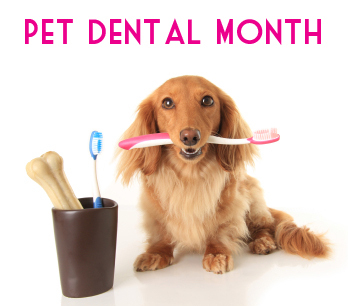 Dental disease is actually seen more often in pets than it is in humans. Why? Because pets can’t brush or ﬂoss their teeth. So it’s no surprise that 80 percent of dogs and 70 percent of cats show signs of dental disease by the age of four. In fact, dental disease is probably one of the most common health problems in dogs and cats. So, to keep your pet smiling, schedule regular veterinary dental exams! This entry was posted on Sunday, February 1st, 2015 at 5:17 pm	and is filed under Articles, Dog, News & Updates. You can follow any responses to this entry through the RSS 2.0 feed. Both comments and pings are currently closed.